Nutricanis snacks are grain-free/cereal-free treat alternatives that are made using premium ingredients and have a great taste. 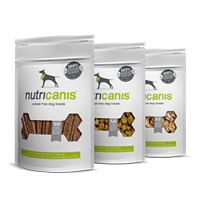 Whether as a reward for the active dog, for occasional pampering, or as a low-calorie treat – our snack recipes are a sensible addition to all Nutricanis complete dog food varieties. An ideal option for when you are on the go or for between meals. From crunchy chew strips to delicate soft chews and crispy biscuits, Nutricanis snacks are completely grain-free/cereal-free and contain carefully selected ingredients such as the best meat for great taste as well as nutritious vegetables and vital nutrients. The snacks are available in different versions: with a high percentage of high-quality, protein-rich meat for the active dog - especially crispy for lasting chewing pleasure - with nutritious vegetables and fine taste for a treat between meals - or crunchy and low in calories for a little guilt-free pleasure. Unlike many traditional treats, none of our recipes contain sugar or sweeteners. This means that you can occasionally treat your dog to an extra portion while still helping him to stay in shape.